Cadillac Escalade Limo Services for all Events. 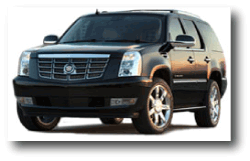 The Cadillac Escalade limo is a versatile limousine for many different events and occasions. It is one of the largest traditional car style limousines without upgrading to a Hummer or SUV. Some of the stretch Escalade limousines can accommodate up to 25 to 28 people and is a rolling party. There are some, usually the white vehicles that have wood dance floors, bars with drinks and a bartender, flashing lights, neon and LED lights in addition to couch seats or captains chairs. These large limos are great for large parties like groups of friends for bachelor or bachelorette parties, people heading to a concert, sports event or other special occasion in which several people want to arrive together and in style. With the Cadillac Escalade limo, there is no need to worry about finding a place to park downtown Toronto , stopping for gas or printing off directions before leaving the house. The chauffer will take care of everything that one typically worries about when traveling to an event in the downtown area or on a special day. These large sedan style limousines are very exclusive and versatile. It a party atmosphere is not what an individual or company needs, then there are sleek, black cars with more traditional seating for picking up clients, airport guests or the head of a company. These exclusive and executive style limos help a company make a statement of style and prestige. If a company is sponsoring a seminar for their business, then renting one of the Cadillac Escalades SUV is ideal for taking several of the VP's to the hotel or other place the venue that will be hosting the event. These types of limos are not strictly for business, they can be dressed up for a formal dance or the prom. Many students pull their funds together and rent Cadillac Escalade for the evening for a group of people to share and have fun going to everyone's house to pick up their dates in style. Most of the party style long limo rides would be reserved for older groups of people and the proms and formal dances could still be in style with the elegant and classy Escalades that contained traditional seating. For a special event such as someone turning 21 or a sweet 16 birthday celebration, these long limos would make a great addition to the evening. Everyone in the party would be able to leave there vehicles at the limo company or one house and have the Cadillac pick them up and take them to all the places planned for the evening. Parents will love the fact that their youngster is not driving on such a special night and will arrive home safely. And the person doing the celebration won't mind arriving in style at their destination.